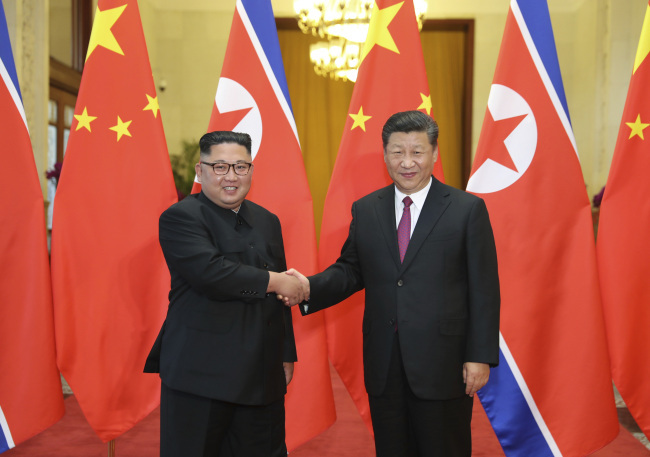 North Korean leader Kim Jong-un held talks with Chinese President Xi Jinping on Tuesday afternoon, according to media outlets of the two countries, apparently to discuss a second summit with US President Donald Trump concerning denuclearization. Kim arrived by train at the Beijing station at 10:55 a.m. Tuesday, which happens to be his birthday, at the invitation of the Chinese leader, North Korea’s state-run Rodong Sinmun and China’s Xinhua News Agency reported. He was accompanied by his wife, Ri Sol-ju, and high-ranking officials, including Kim Yong-chol, North Korea’s chief nuclear negotiator with the US; Foreign Minister Ri Yong-ho; Defense Minister No Kwang-chol; Workers’ Party of Korea Vice Chairman for Science and Education Pak Thae-song; Workers’ Party of Korea First Vice Director and Kim’s younger sister Kim Yo-jong; and senior diplomat Ri Su-yong. The four-day trip from Monday to Thursday is Kim’s fourth official visit to China, following three summits with Xi in March, May and June 2018. The North Korean leader departed from Pyongyang on Monday. Kim will be spending more time in the neighboring country compared to his two previous trips, which lasted for two days each. The first visit was also a four-day trip. Kim is also expected to visit industrial facilities in China, especially in the Tianjin area, according to Seoul’s National Intelligence Service. The South Korean government said it welcomed Kim’s trip and expressed hopes that his talks with the Chinese leader would help bring about denuclearization and advance the peace process on the Korean Peninsula. “The government expects high-level exchanges between the North and China, including a meeting between Chairman Kim Jong-un and President Xi Jinping, to contribute to the complete denuclearization and the establishment of permanent peace on the Korean Peninsula,” a Foreign Ministry official said.